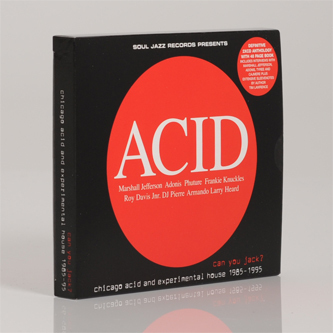 *2013 Repress* Classic 17 tune overview on double cd dedicated to rare and classic original chicago acid -and actually looking for the biggest, most leading-edge tracks. Knowing none, some or actually many of these tunes is almost irrelevant - when presented with a short history of all the music you first heard going out, like this. Manchester was volatile enough 1985 - 1995, so I wouldn't have even begun to imagine what Chicago was like, but the music gave us a pretty good idea. Heard on a loud system in an echoey cold room, more like a car park than anything else, it sounded magical - synthetic, hedonistic - futuristic music made with almost no elements at all. House was the ultimate reduction of everything - you could hear new sounds, disco, sleaze, funk, dancefloor dubs - a technological music that managed to be completely primal - the sound of black chicago remaking rhythm and in the process completely scrambling the world's cultural agenda.. Marshall Jefferson is rightly given major billing, Larry Heard, Pierre, Adonis, Lil Louis massive dancemania 'Video Clash", early Adonis as The Sweat Boyz on "Do you want to perculate?" , Armando's staccato masterstroke "Downfall", listening to Tyree's "Acid Crash" - you become unclear as to what you've heard before, so disorientating, so compulsive is the onslaught of classic acid to this day. Phutures's shocking "Acid Tracks" sits comfortable in the knowledge you can't really touch it. Special mention goes to the definitive thumbnail booklet - 52 pages, with text by Tim Lawrence, author of Love Saves The Day - a discerning fan and vigorous knowledge. Also check the fascinating, funny, candid and highly revealing interviews with all the major players, Jefferson, Adonis, Tyree, Cajmere and more. Surprise moment for me was discovering Roy Davis Jnr's wicked 'Acid Bass' from '95. Many mancunians round these parts will recall formative moments spent listening to some of the early examples of music contained on this excellent album - a worthy testament, above all things to the deviant strain of partying and music generated Ron Hardy at his acclaimed Music Box shows.